Increase in Kidney Failures Combined with Low Costs Drive the Market for Renal Dialysis Equipment to Grow by 5.9% through to 2024 – Market Report (2018-2024) by Industry Experts, Inc. The global market report analyzes renal dialysis equipment product types comprising Hemodialysis and Peritoneal Dialysis. The study also examines the key applications of renal dialysis equipment including Medical Center Dialysis and In-Home Dialysis. This report reviews, analyzes and projects the Renal Dialysis Equipment market for global and the regional markets including the North America, Europe, Asia-Pacific, South America and Rest of World for the period 2015-2024 in terms of value in USD. These regional markets further analyzed for 14 independent countries across North America – United States, Canada and Mexico; Europe – France, Germany, Italy, Spain and the United Kingdom; Asia-Pacific – China, India, Japan and South Korea; South America – Brazil and Argentina. The market is analyzed in each region by key country, product type and end-use application. 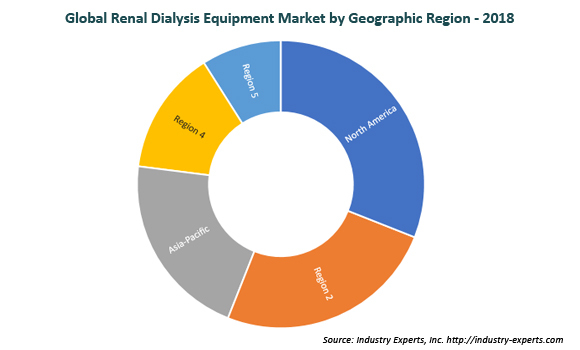 This 262 page report on Renal Dialysis Equipment market includes 151 charts (includes a data table and graphical representation for each table), supported with a meaningful and easy to understand graphical presentation, of the market. The statistical tables represent the data for the global market by geographic region, product type and major end-use application. This study profiles 15 key global players and 20 major players across the North America – 9; Europe – 6; and Asia-Pacific – 5. The report also provides the listing of the companies engaged in research & development, manufacturing, supply and provision of Renal Dialysis Equipment. The global list of companies covers addresses, contact numbers and the website addresses of 70 companies.